The weather on New Year’s day 2013 continued what has been rare over the last decade – a dry spring and early summer. It last happened in 2006 and before that 2002. But 2012 was very different to those two drought years in one respect, we had record winter rain giving a deceptive above average annual rainfall of 715 mm. Koalas. 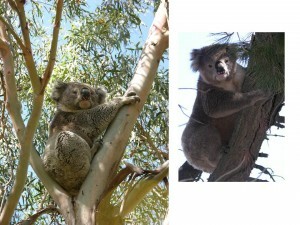 In 1986 the koala was the species we so much wanted to return when making the farm environment plan. As a boy on my parent home farm ‘Linwen’ (over the road from Moffitts Lane) koalas were always present in the old manna gums lining the creek. They were never on Moffitts Farm – it had no gum trees to attract them. Surveys conducted regularly around the Macedon Ranges over the last decade indicate these animals are rare in the district. Most nights at Moffitts Farm koalas can be heard calling as they move between forests and along habitat corridors and the riparian zone, all planted with a range of eucalypts and in particular manna gums – their favorite food. (The seed came from trees on Linwen). Despite apparent declining numbers of koalas in the nearby Macedon Ranges, some koalas now call Moffitts Farm home. Forest Brown butterflies. These are a relatively new arrivals, at least in the swarms we now experience starting in late November. Walking through the forests or paddocks alongside the conservation corridors hundreds of these butterflies startup from their perches on grasses and tree leaves, then set down again as you pass. It is the insect world’s beauty at its best and lasts for around four months each year. 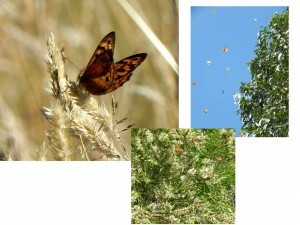 Summer walks around Moffitts Farm are even more rewarding with forest brown butterflys everywhere. Pasture spiders. Not often recognised for their contribution to ecosystems, paddock spiders are one of nature’s architects at Moffitts Farm. 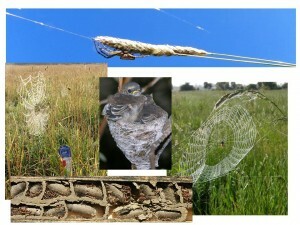 Using the tall seed stems of perennial grasses particularly tall fescue, cocksfoot and phalaris as pillars, these unobtrusive spiders constructs thousands of webs across the paddocks. They are only seen on dewy autumn mornings as the sun’s rays glisten off the water sitting on every thread. Ironically while the spiders are great architects themselves, so to are some of the insects that prey on them. The implications of holistic grazing management and allowing grasses to set seed is impressively demonstrated by pasture spiders. They spin webs to catch prey, become prey for wasps and web is used by some birds to line nests. Buzzing wasps. The small black wasps that can be heard buzzing throughout summer around the Moffitts Farm sheds and yards are another amazing architect. Their skill at filling any small diameter pipe or hole with mud compartments in which their spider prey is placed as a meal for their young, can only be admired. Raincoats unused for weeks are a favorite site for these mud nests. They only become apparent when unfolded to reveal in a crease multiple mud chambers packed full mostly of pasture spiders. Frogs and more frogs. While many people associate frogs with water at Moffitts Farm this is not necessarily the case. 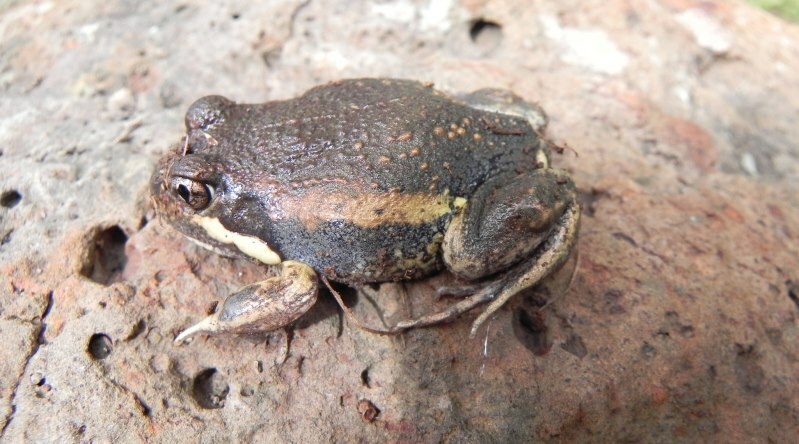 We have frogs of all shapes and sizes and many are uncovered well away from dams and the creek. They must move from water bodies into the thick perennial grass crowns and accompanying organic matter, as well as to harbour under rocks, timber. While our most prolific frog has a black/brown body around the size of a 50 cent piece and a dark line down the middle of its back, three new species (for us) have recently been found in different situations – on a float valve in a stock water trough, in the cottage on some fire wood, and 4 meters up a Casuarina tree (seen while pruning). 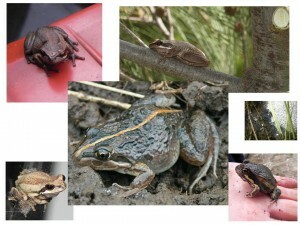 The diversity of frog species continues to increase on Moffitts Farm. Earthworms. There must be something in the soil at Moffitts Farm which not only means earthworms are prolific, but many are also big (about double the length and circumference of common worm farm types). The worms enjoy the organic matter food and protection provided by the prolific perennial grass crowns and their surrounding organic matter covering every square centimeter of soil. As well, regular (about every 12 – 14 weeks) deposits of livestock manure provide an alternative food source and harbor from heat in summer. 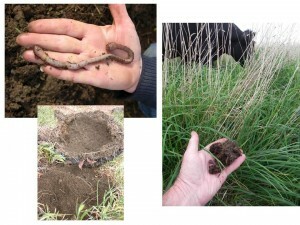 In the wet summer of 2010/11 and 2011/12 organic matter and worms could be picked up by the handful in the paddock. The smell of the composting organic matter was a delight. There is no better indicator of the presence of plentiful labile carbon (organic matter) in pasture soil than earthworms. They can be picked up in surface litter when moisture conditions are right such as in the 2011/12 summer. Toadstools (fungi). 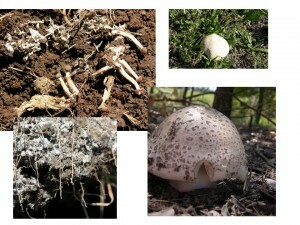 Fungi like soils with plenty of organic matter which is their source of food. With the right rain and heat, Moffitts Farm now produces a wide range of toadstool displays representing a range of species enjoying the high organic matter conditions above and below the soil surface in forests and pastures. The fruiting body of fungi, toadstools, are another important indicator or high levels of labile carbon in the soil. At Moffitts Farm they emerge in all shapes and sizes, while hyphae can be seen surrounding the roots of perennial grasses. Microbats. These are a bit like the buzzing wasps, they are well adapted to making their homes in and around man-made structures. While they are seen each evening flying around after insects, many have been uncovered sheltering in roles of carpet, between piles of stored timber, and behind objects hanging on walls. Echidnas. Another early returner once habitat corridors provided them with shelter and more food. But they are spotted just as often in pastures and forests as in the corridors. Moffitts Farm has a reasonable ant population which came obviously apparent in pastures during the wet summers of 10/11 and 11/12. The tall seed stems of the perennial pastures provided ideal “posts” for ants to build nests around to escape their flooded underground homes. The tallest nest measured 14cm high. 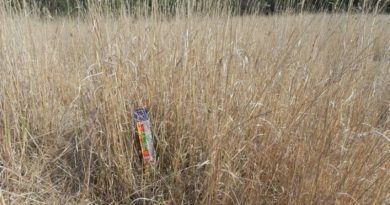 Just like for the pasture spiders the implications of leaving perennials grasses set seed has multiple flow on effects for ants and subsequently their predators. 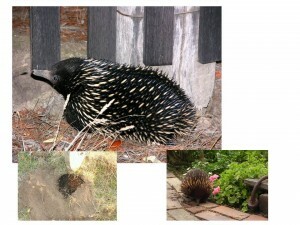 Echidnas wander all over Moffitts Farm and turn up in unexpected place even in the cottage garden. Blue tongue skinks. These skinks are now common right across the farm, from the house garden to the centre of pasture paddocks where they are protected by the dense perennial grasses and organic matter present. The blue tongues are just one of a number of skinks on the farm, many smaller skinks are common through the pasture where they are briefly seen as they scurry away when disturbed. Birds – too many to choose from. 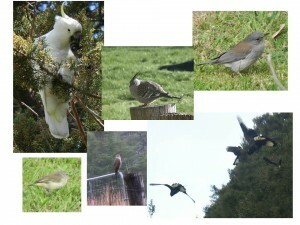 The standout “new” birds to Moffitts Farm particularly since the forest lots were planted, and main dams and creek riparian fenced off are:, blue wrens, red-browed finches, kookaburras, crested pigeons, choughs, fan tails, yellow tailed black cockatoos, sulphur crested cockatoos, crimson rosellas, grey shrike thrush, grey herons, cormorants and ducks (various species). There are many other small bird species yet to be identified present year round, plus itinerants such as flame robins, swallows, hawks, and black shouldered kites. An exciting long-lost returner is quail which have taken up residence in the thick intermittently grazed perennial pastures. Quail were once so common in the 1950’s my father would have friends visit for a quail shoot, using Labrador dogs to startle them into flight. More and more species of birds keep coming to Moffitts Farm. The diversity in the food web must attract them. The exciting thing about the Moffitts Farm biodiversity experience is that nature provided it all for free, yet its value is enormous. Sure we helped by making a farm plan and fencing accordingly, planted 10,000 trees and shrubs, planted vigorous year round green perennial pasture species and support them with appropriate nutrients, manage livestock to ensure high quantities of ground cover are maintained year round, and control predators and invasive species like weeds and excess eastern gray kangaroos. The methodology involved for us to implement is relatively simple while the biology is complex but give nature the chance and she can take care of that. The following media release demonstrates how environmental science can make a mountain out of a mole hill and can cost tens of thousands if not hundreds of thousands of dollars in project costs and external monitoring each year. Once farmers on larger properties than Moffitts Farm have some support to implement environmental plans across their properties and understand carbon flows in their farming landscapes, then a host of ecosystem services will be achieved. Farmers across Australia who have adopted Holistic grazing management and conservation precision cropping demonstrate this. 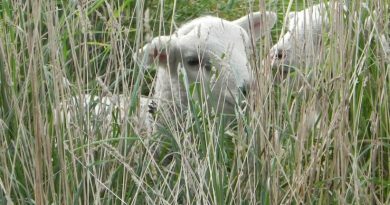 On many farms, particularly where native species grassy woodlands are dominant, little external input is required. In farmed landscapes where crops dominate and native species have been replaced as on Moffitts Farm more interventions are needed to start with. 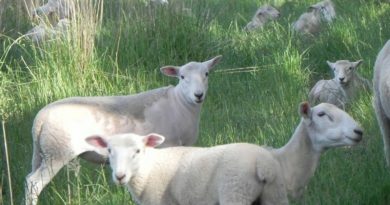 Despite what this media release claims there is nothing new about many enlightened farmers making major improvements to biodiversity on their farms in conjunction with producing food and fibre. Emotive descriptions of existing biodiversity as “critically endangered” undermines scientific credibility in most cases. When farmer stewards are given the opportunity and knowledge nature is a great healer. Monitoring is not difficult: asses soils, vegetation and food web species on both farmed and conserved areas at critical seasonal times throughout the year, record observations, and repeat observations year after year. Encourage and invite non-scientists for examples local clubs, school children and even city office clubs to join in monitoring as an annual group activity. Australian farmers and scientists working together have developed a world-first approach to restoring native landscapes on a large scale and measuring their recovery. In one of the largest conservation projects of its type in the world, environmental researchers have developed a new, lost-cost, system for monitoring the recovery of wildlife and native trees and grasses on 153 farms spread over 172,000 square kilometres of the critically endangered grassy woodlands of NSW and Queensland. Restoration of native woodlands is taking place in farming landscapes all around the world – but until now there has been no easy or cost-effective way to monitor progress, says Professor David Lindenmayer from the Environmental Decisions Hub (EDH) and The Australian National University. While farmers are generally keen to conserve biodiversity on their lands, they often lack the information to tell them which approaches work best and which don’t, Prof. Lindenmayer explains. Under the Environmental Stewardship Program, the project involves contracting landowners to restore grassy woodlands on NSW and Queensland farms over a period of 15 years. These woodlands are rated as critically endangered, and have been reduced to three per cent of their original area. Today the remnants are mainly small patches of trees on private farmland. Working with the farmers over a decade, the researchers established 268 monitoring sites on farms over a 1500-km stretch of country from southern NSW to southern Queensland. Their survey of plants, birds and reptiles on the sites reveals that straightforward conservation methods, including reducing grazing pressure, weed control, fencing and re-planting of native vegetation are proving successful in restoring native vegetation and wildlife. “Over the last four years, we compared restored sites with sites where no conservation work was done,” says Prof. Lindenmayer. “We found that there were significantly more native plants and birds in the restoration sites, and fewer invasive species. To keep monitoring costs down, especially in large scale projects, the scientists have proposed a new way to observe the environmental outcomes of conservation programs. “We propose a full survey at the start, followed by sampling different farms for the next four years, and doing a full census again in the fifth year,” Prof. Lindenmayer says. “For instance, if we have 250 sites to monitor, we’ll observe 150 sites this year, and use advanced statistical modelling to pick 150 sites the next. If applied to the Environmental Stewardship Program, this new way of sampling can save a hundreds of thousands of dollars each year, compared to the traditional method of monitoring a fixed set of sites annually. “This new approach has been shown to work in possum conservation programs in Victoria, and lends itself beautifully to a large-scale study like this,” Prof. Lindenmayer says. “Landscape restoration policies are usually well planned, and now we have good science to support them. This project has involved many different groups working together, including environmental managers, farmers, policymakers and scientists. Everyone is happy with the results. The study “A novel and cost-effective monitoring approach for outcomes in an Australian biodiversity conservation incentive program” by David B. Lindenmayer, Charles Zammit, Simon J. Attwood, Emma Burns, Claire L. Shepherd, Geoff Kay and Jeff Wood is published in the latest issue of PloS One. See: http://bit.ly/122HeYK.